Should I get a Subaru Outback? I'm considering getting an Outback but I'm reading such mixed things about the reliability. Many people say that they are very reliable cars (minus some years in the early 2000's) but there are still some major problems. I want something reliable that is kind of/fairly rugged that has some room in the back for toys (camping equipment, guns, lugage, etc.). I really like the AWD feature and road clearance. I don't do anything crazy off road but I like not having to worry about it. Anyone have any suggestions for another SUV that's similarly priced but maybe more reliable or is the Subaru the way to go? I have a 2016 Subaru Outback, 4-cyl engine, purchased new in April 2016, almost 11,000 miles on it now. I absolutely love it. If anyone asks my opinion about Subaru, I can only say great things!!! 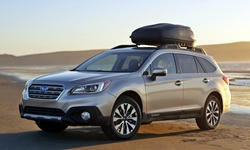 I have two Subaru Outback a 16 limited bought in Nov 15 with over 25K that my wife drives. It has the 4 cyl engine and averages mid 20s in tonw and low 30s on trips. She drove it on five long trips the first 4 months she had it. We have not an any issues with it other than my personal preference it needs more hp. I purchased a 2017 Touring Outback with the 3.6R engine last September. Yes it does not get the same gas mileage as the 4 but the difference is not that great, I would do it again without a second thought. I took it on three trips the first 5 months and had to go to the dealor after my last trip to replace a wheel bearing. Other than that it has been maintnenance free as I approach 11K. Regarding the wheel bearing issue, I have had three previous Japanese cars (made in America) that had wheel bearing failure in the last 5~6 years so I blame the secont tier suppliers for this and not the OEM. In addition to my two Subaru Outbacks I own a 16 Toyota 4Runner Trail with locking rear dif that I think of as the ultimate need in off road and also use daily. Looking at the Subaru and the Toyota I can see differences but the truth is the Subaru may be able to match the 4Runner in 75~80% off road use if you are only talking about doing trails and nothing crazy. We're on our second Outback, the 1st was a '14, the current one is a '16. I like the '16 a lot better, it corners more confidently and just handles better in general. '15 and later Outbacks have upsized brakes, wheel bearings, and hubs compared to the '14 and earlier models. Smaller bearings might be a source of issues in those earlier models. Higly recommmend Subaru's across the board, winter traction and crash protecion are 1 and 2 for us in any car/truck, Subaru is top notch in both! First, let me say that your question went out to Subaru owners so we may be particularly biased. We have a 2010 that my daughter drives. We bought it used and it now has 65k miles on it. And actually the entire family enjoys this car. It makes all our camping, kayaking, and hauling trips and is her dd. I will admit that I find it lacking in terms of hp but is perfect for her. I am used to driving a car like I stole it so I'm not a good judge in that department. We have had no issues with the car at all except the replacing the airbag component that was under recall last fall. My sister and brother in law both have Subarus and they've been very happy! They both live in the snowy northeast and they are great cars for less than perfect weather. Do you need an AWD in TX? I live in upstate NY. I have a '15 Outback 3.6R. It's been outstanding. Over 52,000 miles w/o a problem. I have the oil changed every 5,000 miles - it doesn't use a drop between changes. Never been to the dealer for other than routine service. (Has been in for 2 recalls - dealer took care of it of course.) I've hauled 3 kids in car seats. I've hauled joint compound buckets full of alpaca manure. A huge Golden Retriever. If you need something with more interior space you'll have to look at a Pilot or something similar. I would totally recommend the Outback. I am on my second Subaru (first a 2003 Impreza 2.5TS Wagon and now a 2011 Outback 3.6R Limited). Both have been rock solid for reliability. For some reason Subaru has a lot of online haters who harp on the "bad" reliability of the brand. Maybe due to the 2.5L non-turbo 4 head gasket issue on the late 90's - early 2000's, but that was addressed in '03. Likewise some of the early 2.0L direct injection engines had an oil consuption problem - also rectified. Otherwise I have heard of no problems and my own direct experience has been totally positive. Go ahead and buy the Outback with confidence. I love mine to bits. My wife is on her second 4 cyl Outback Ltd. She traded in her first, a 2009, for a 2015. While she loved her first Outback, it had constant recurring electrical problems with lights and switches. After about 20k miles, it seemed like she was bringing it in to the dealer for something on a monthly basis. At about 90k, the head gasket had to be replaced so that's when we decided the car had to be replaced since the repair would be very expensive, everything considered and so she traded it in on the 2015. Although both the 2009 and the 2015 are the Ltd model, the 2015 was a wonderful upgrade over the 2009 in space, comfort and safety. I am happy yo say that both she and I are very saftisfied with everything about her 'new car.' The wagon now has close to 50k and it has only been back to the dealer or our local service station for scheduled service. I would suggest limiting your search to a 2015 or later 4 cylinder Outback if want the best chance of being a happy camper because, based on our experience, the 2015 is far more reliable than was the 2009. I drove the 4 and bought the 3.6. Both of my previous Subarus were 4 cylinder. I do a lot of 2 lane highway miles. There's limited passing areas. I need the extra power. On my Interstate trips, I've found the extra power while merging, or passing, to be nice. Is it essential? Can't answer that. Worth the money: to me yes. Our 2008 is our third Outback and likely the last. Previously we had a 1998 and 2001. While the first two seemed bulletproof, the third has not. The cylinder head gasket failed at 62,000 miles. Subaru paid ? the $1,500 cost. Recalls for the brake pipe, ECM reprogramed, and passenger side air bag. The front catalytic converter failed. The rear strut assembly failed and lots of small issues such as loose & missing engine mount nuts for torque bars, front axle boot kit, rear sway bar looseness, replaced four noisy heat shields from the center pipe back, plus a torn left front inner axle boot. Should say Subaru paid one-half the $1,500 cost. A year ago I would have wholeheartedly endorsed getting a Subaru. I've had Subies and concur that they're hardy, generally reliable cars, and even with the popularity price premium you might pay, still a good value. My last went 200-plus K miles, and I replaced it only when the clutch died. I first thought I'd just get another one but consulted other people, both drivers and mechanics, and I began to question whether I really needed all-wheel-drive. It means a loss of fuel economy versus comparably sized cars, extra weight, and, I suspect, stress on other parts of the suspension, which had been an issue on that Outback and a previous Legacy. I live in upstate New York, but even in winter, most driving is on dry roads. I opted for a front-wheel-drive car and a set of high-end snow tires. After one winter and a summer of some long-distance trips (800-plus miles one-way), I think it was the right decision. As for the engines, I had good luck and didn't have to replace them (maybe a previous owner did), but whether that's been fixed or not, the horizontal engines are a bit eccentric; you might want to find a Subie shop for any engine work once out of warranty. So I would suggest thinking about whether you really need all-wheel-drive. I can't imagine you drive on snow often in Texas, and snow seems the real reason for AWD. Going off-road strikes me as a separate question, more about ground clearance, suspension wear, and durability. If I were often going truly off-road (as opposed to gravel and dirt roads), I'd consider a truck actually made for it, though I suppose a Subie is good for occasionally leaving pavement. Good luck in any case. As a little bit of a counter statement I would have say that the Subie is a great value for AWD and generally speaking it is $10k under most others. Horizontal engines have been around in volume since the first Mini in the UK in the early 60s, so that's nothing new. My earlier point was that their quality has slipped. Heck, they know it. They replaced many of the upper management for letting quality control slip because of the increased demand. And, in some cases for not correcting some issues that they have know about for many years. Member 5396 is correct. Subaru has had quality issues so a warranty would be a good investment as the oil consumption or head gasket can pop anytime.